Decorating cookies can be hard work. I know at least some of you agree with me. And it’s one of those things that should be fun at all times. Decorating cookies shouldn’t be stressful but it often is. 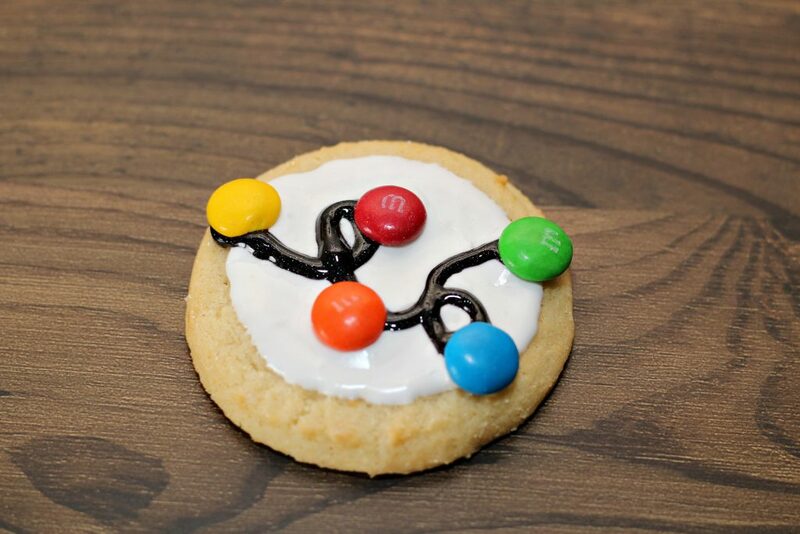 Pinterest and Instagram are flooded with cookie works of art. And what normal person with non expert level cookie decorating skills can compete with that? Well, now those of us without serious cookie decorating skills can compete. These Christmas light cookies are a no fail way to decorate an adorable cookie without a PhD in cookie decorating or pastry art. Just start with an round sugar cookie and add a circle of white cookie icing in the middle of the cookie. Let the icing harden. When the icing is hard, pipe on a curvy line of black gel icing. Let the gel icing just start to set, but don’t let it set all the way. 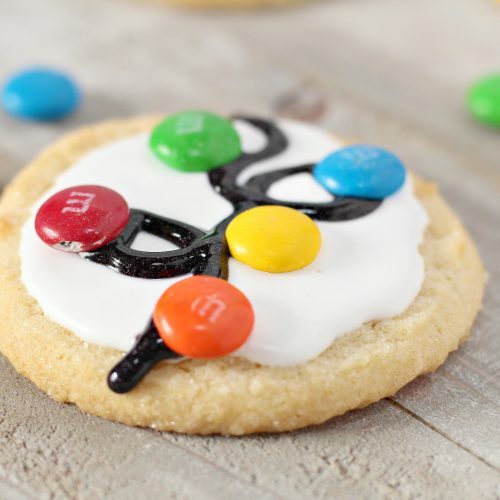 Then add several M&Ms onto your black icing at different points. Let the icing set totally to hold the candy in place. 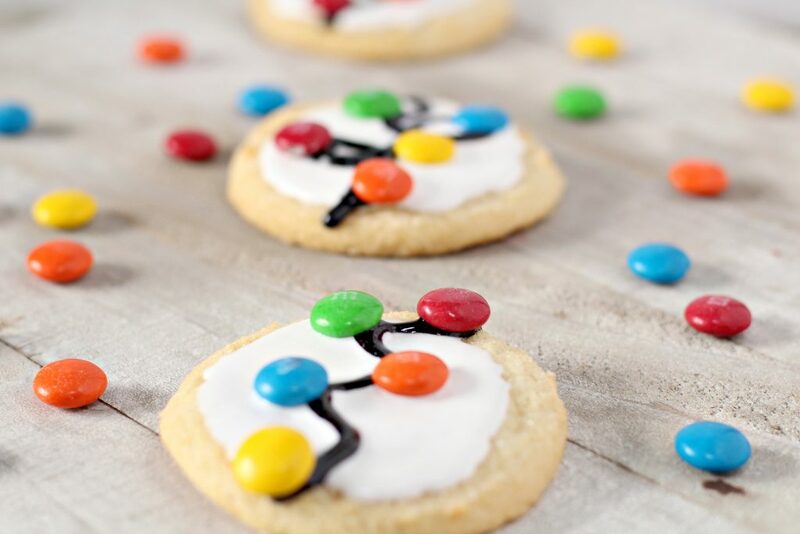 For some variety, try piping different patterns of black lines on to your cookies. Make some curvy and try others more zigzagged… Whatever you like. Whatever design you draw in the gel to be the light strand, you need to let the cookies set totally. You can leave them alone overnight, or if you need them to be ready more quickly, you can pop the cookies into the freezer so the gel hardens fast. This trick is great in a pinch like when you need to take cookies to a holiday party that night. Not that that ever happens. More than two or three times. And just like that you have designer level Christmas light cookies that even Martha Stewart would go crazy for. No crazy piping skills needed. A chewy, traditional sugar cookie is topped with creamy white icing. 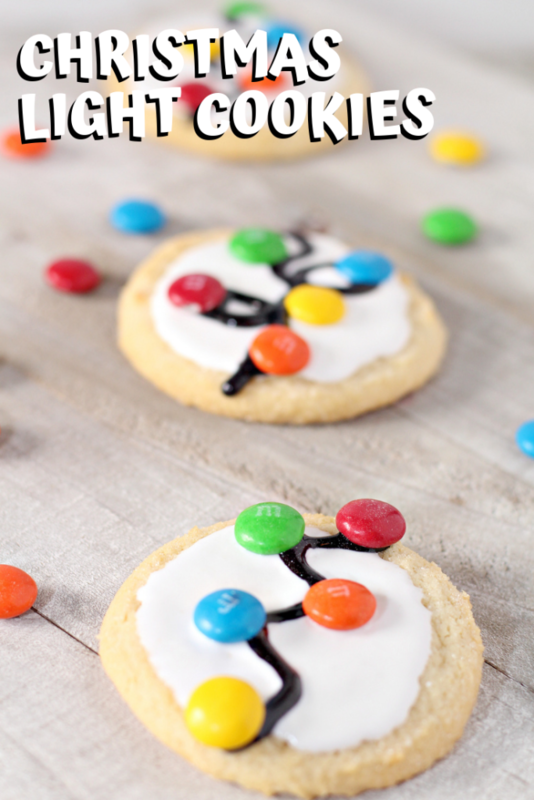 A string of black decorating gel makes the string, and bright candy M & M's make edible lights on an adorable family friendly Christmas craft. Start by putting your white cookie icing on each cookie. Start on the outer edge and work your way to the center. Make sure it's a fairly thick layer. Let your white icing harden and set. 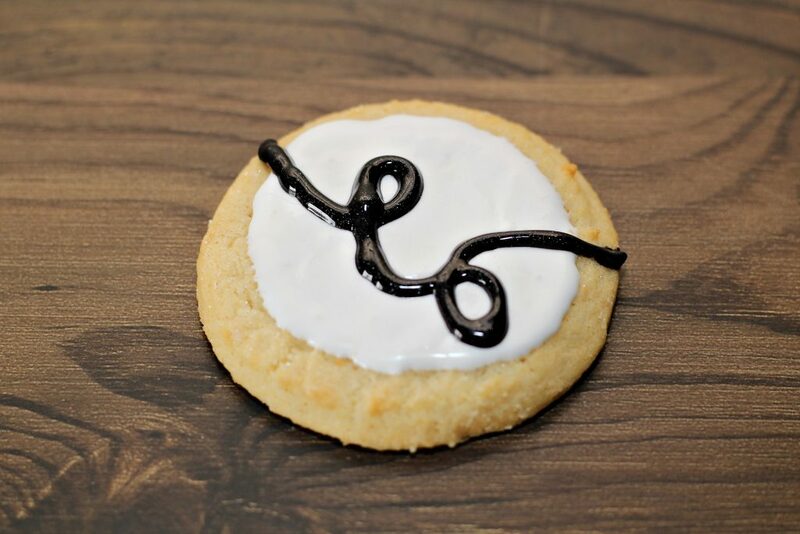 Take your gel icing and carefully make strands from one side of the cookie to the other, as shown. You can make your lines straight or curled, up to you. 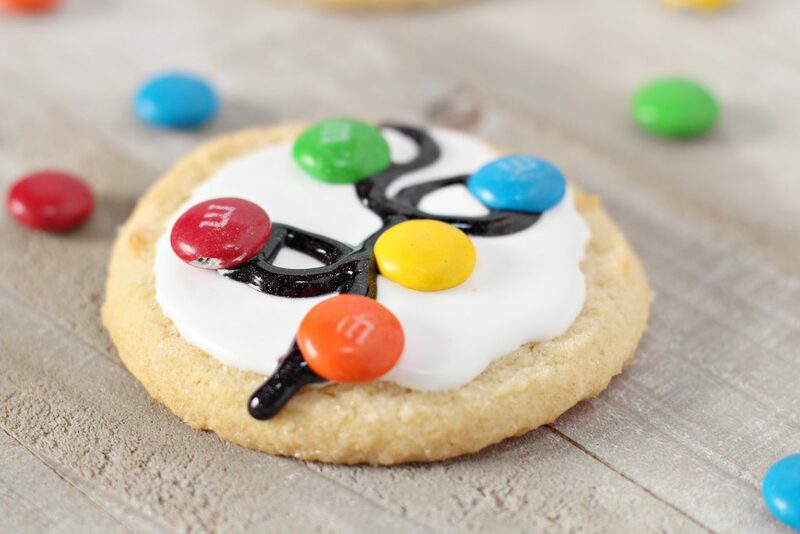 Before your gel icing sets, place one of each color M&M on your black icing, as shown. 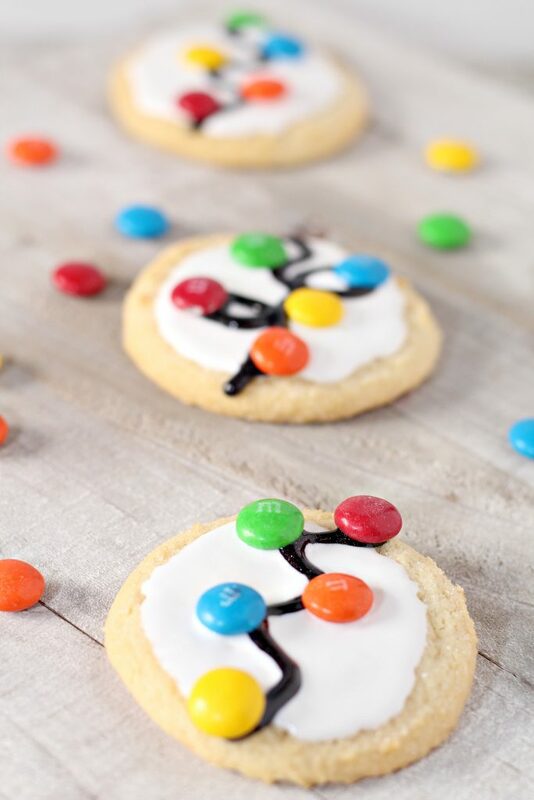 Let your cookie set, you can even place them in the freezer briefly. Thank you for bringing these to share on FF. Cookie decorating used to be one of our favorite traditions when the kids were young. Happy holiday.